This is the only photo I have seen of A type; More than rare, extinct. this is the first model produced by Energic in the 1930’s. Engine/Moteur. Single cylinder, air cooled, 4 stroke, Chaise motor of 9 hp (cv). 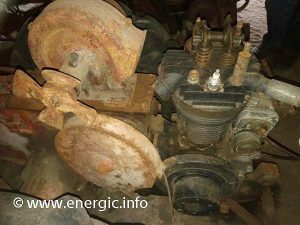 Energic A treuil moteur Chaise 9cv. 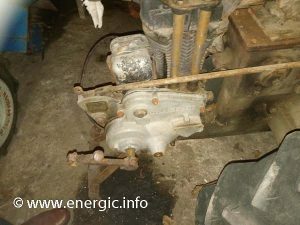 Energic A treuil moteur Chaise 9cv – left side. Lubrication. 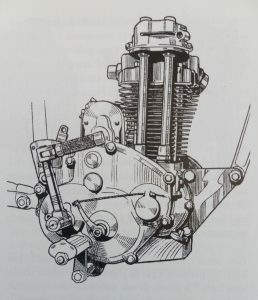 Automatic oil distribution under pressure within the crankcase. Starting; By kick start lever as in the motorcycle engine. Cooling. 2 fans mounted on a shaft lubricated by grease cups, running on bearings. Energic A treuil moteur Chaise 9cv fan ventilation system. 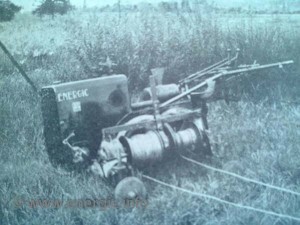 Double or single Winch. Operated from a drive on the side of the machine. 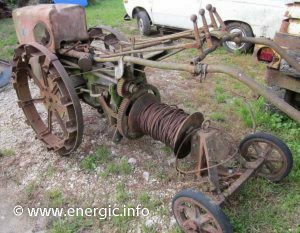 A rare fined Energic treuil series 1 – ready for restoration. Many of these machines where unfortunately scrapped for the moteurs, and metal salvage.